CLUBs. Ronhill Cambuslang (previously Westerlands 2000-2014). OCCUPATION. Naval Engineering at BAE Systems. 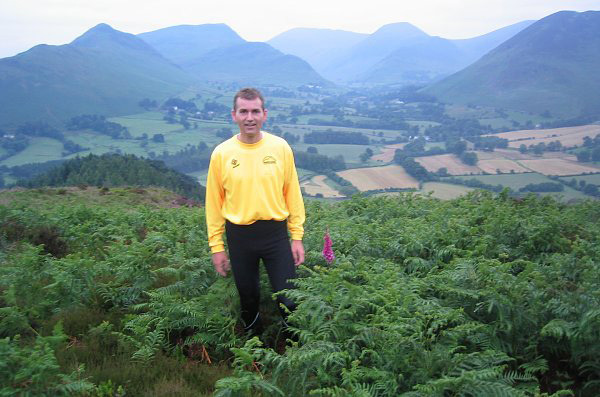 Very gradually… From 5 years old I knew I wanted to run on the hills and explore wild places. Teenage years were spent exploring the English Lake District on foot and bike. Mid 1980s I caught the Munro-bagging bug, and have since climbed all the Scottish Munros and Corbetts. In 1989 I had a near fatal climbing accident that broke my ankle and crushed a lumbar vertebra. In 1990 I came back more determined and climbed Mont Blanc, then Elbrus in Russia in 1993. I then spent 10 years rock climbing around Britain, Europe and the United States, before thinking about trying a couple of hill races in 2000 with Glen Rosa and Borrowdale. Since then I’ve completed more than 800 races, plus visiting Nepal 6 times and hiking across the Pyrenees 2 and half times. Races have ranged from 800 metres at the Emirates, to the 10-stage Everest Sky Race in Nepal. Recently, the stalwart veterans at Ronhill Cambuslang and SVHC Masters have inspired me to keep working hard. Uncompromising runners like Paul Thompson, Colin Feechan and John Thomson show that you can still perform at a high level as a V55. I guess that growing up in the 1970s I’m inspired by keeping things simple, and remembering the importance of physical discomfort. A sense of belonging. A sense of purpose. WHAT DO YOU CONSIDER TO BE YOUR BEST EVER PERFORMANCE? Best performance: 1st M50 at Scottish Masters Cross Country at Kilmarnock in January 2015. I don’t remember any worst performances. I think all performances are part of the learning process. Sub 2:50 marathon. Possibly a World Masters track medal. Playing violin. Playing with my 3-year old son Benjamin. That gut-churning sense of excitement before every race. The sense of relief and peace after the race. Quite ad hoc. At present, just lunchtime runs and weekend races. Occasionally more structure leading up to a marathon. Won the FRA Long Distance Award in 2003 for Lakes24, a new route in the Lake District that bagged 24 Marilyns in 24 hours. My favourite race of recent years is Defi de l’Oisans in France. My favourite Scottish races are probably Two Breweries and Pentland Skyline. Inter Lacs 2003. Restonica Valley, Corsica. 2-Stage event. Very rugged spectacular scenery. Ben Nevis is the most challenging and memorable Scottish race. I also occasionally take photos for the Geograph project; and sometimes play my violin with the Glasgow Chamber Orchestra.